That title sounds dramatic, don’t it? Sorry…I’ve had Firefly/Serenity on the brain of late. I just haven’t checked-in in a while and thought I’d update on what’s going on…or rather, more to the point, what isn’t. On the submissions front, I’ve got another rejection to add to the pile. I’m going to work that story over a bit and take it to the workshop before sending it out again. I’ve almost exhausted viable pro markets for it. I want to tweak it just a bit before moving down to the next tier (semi-pro). I had received a “maybe” in February on another story but haven’t heard back yet. The next issue isn’t due until May so I’m not giving up on that one quite yet. On a third story I’ve sent a query-of-a-query. I had submitted back in November and hadn’t heard anything. I queried about a month ago and have received no response so I’m nudging again. My fourth submitted story is pending review at another magazine. As far as “new” writing, I’m about three-fourths done with a new urban fantasy piece that I’m hoping to submit to an anthology later this year. I’ve also been tweaking a short-story-that-has-turned-into-a-novella and thinking about bringing it to the workshop later on as well. Lately I’ve also been working on my Serenity RPG campaign (thus the blog title)–which totally counts as writing. Totally. 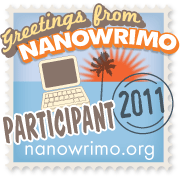 I may need to take down my “250 word-per-day” badge. If there is a “I don’t write every day but when I do it averages to 250 words per day” badge then perhaps that would be more accurate. I’m going to give it another go and see what happens. It’s a brand new week, right? This entry was posted in Ramblings and tagged blog, dfw writer's workshop, editing, fiction, motivation, publishing, sci-fi, short stories, writing. Bookmark the permalink.